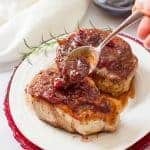 Pork chops with apple butter is an easy, flavorful weeknight dinner that requires just 5 ingredients and is ready in 30 minutes! My voice is ka-put. I’m a croaking frog. And my throat is on fire, causing me to drink my weight in water and other soothing beverages (with a bit of bourbon here and there to kill those germs). Ugh. I sometimes take it as a personal affront when I get sick. Silly, I know, but I mean, I eat really, really good-for-me foods. I exercise a lot. I take good care of myself and I’d like to think that should protect me a little better than it seems to some seasons. 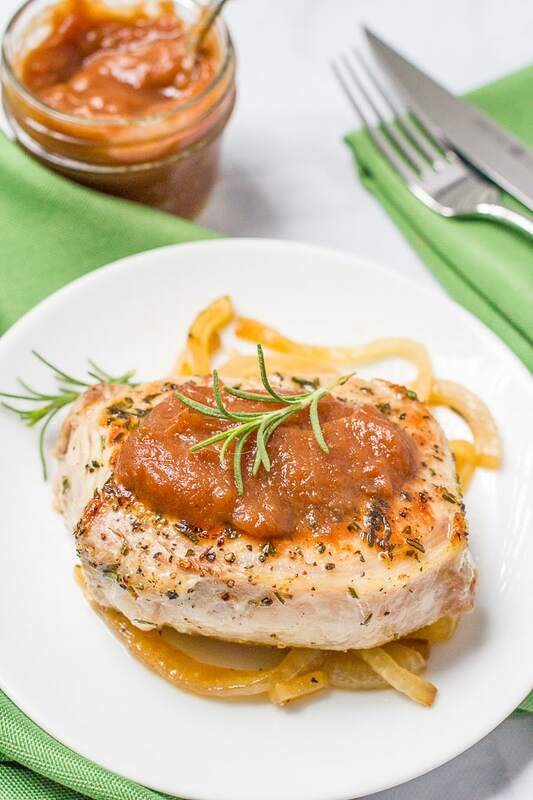 I’ve been excited to bring you these pork chops with apple butter since last fall. Last fall was my first one as a food blogger and I just had two many recipes and not enough time. 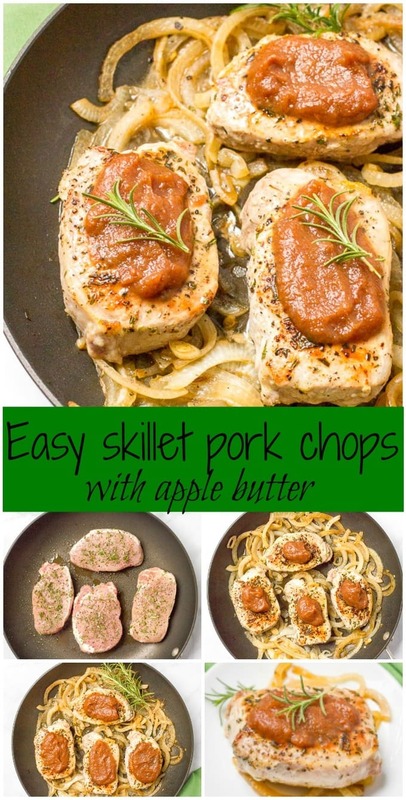 But these pork chops with apple butter are so easy, so delicious and perfect for a fast fall dinner! 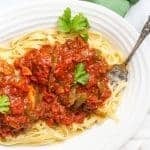 And, like many good things, they were invented one night when I — out of character since I’m never without a full month-long meal plan — didn’t have a recipe planned and was poking around in my fridge. I had pork chops I needed to use and wanted something to add a good bit of flavor. And yes, this was a good plan. A very good plan. 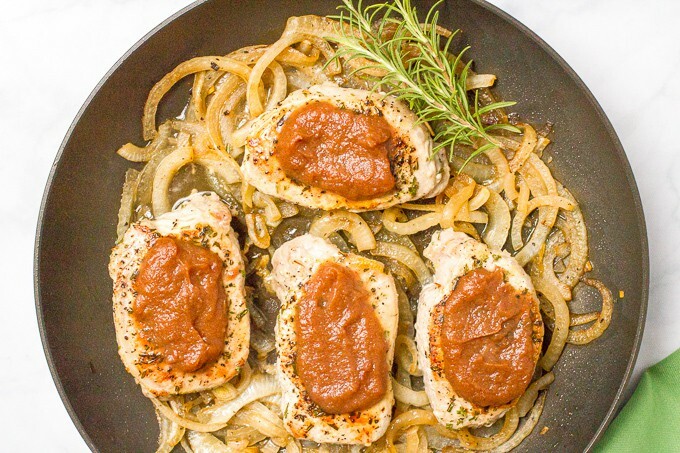 You just need pork chops, apple butter, onion, rosemary and apple cider vinegar (plus olive oil, salt and pepper but I don’t count those as ingredients). And you’ve got a delicious fall main course! It also goes along with my all-things-apple-all-the-time spree currently happening on the blog. 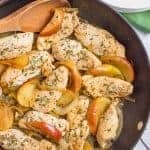 Let me refresh your memory: apple butternut squash muffins, sautéed chicken and apples, fruit-flavored homemade applesauce and the slow cooker apple butter recipe I brought you on Monday. But for today, it’s all about the pork chops. Except you need more than just that for a complete dinner. My quick + easy microwave baked potatoes or paprika roasted potatoes. I love pork with sweet potatoes too, so you could try my spicy sweet potato rounds or my maple cinnamon sweet potato rounds. Add some steamed broccoli, a simple spinach salad or maybe some sautéed green beans and tomatoes. 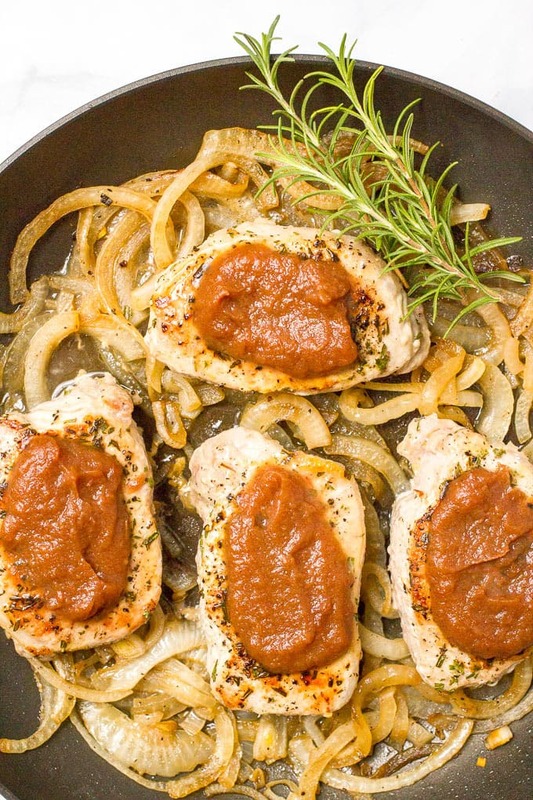 An easy, flavorful weeknight dinner with just 5 ingredients, ready in 30 minutes! Season both sides of the pork chops with rosemary, salt and pepper. Heat 1 teaspoon of olive oil in a large oven-safe pan over medium-high heat. Add pork chops and sear until browned with a nice crust, about 3 minutes per side. 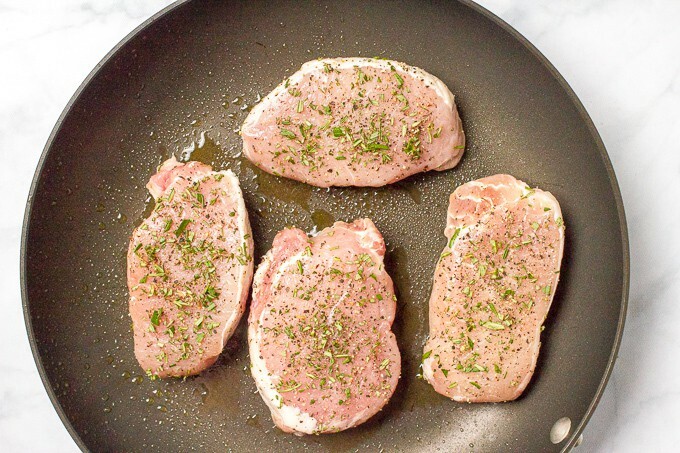 Transfer pork chops to a pan and cover to keep warm. Pork chops will not be cooked through at this point. Reduce heat to medium, add remaining two teaspoons olive oil to pan and add sliced onions. Cook, stirring occasionally, until onions are softened and slightly browned. Turn down the heat if they are starting to burn at all. Season the onions with salt and pepper. Add apple cider vinegar. 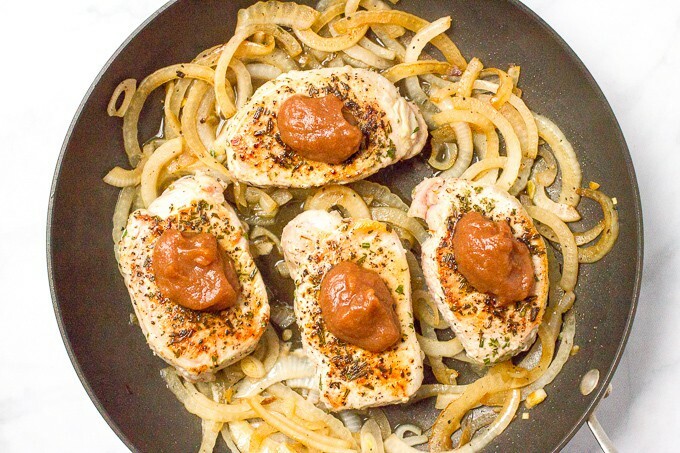 Return the pork chops and any accumulated juices to the pan and nestle in among the onions. 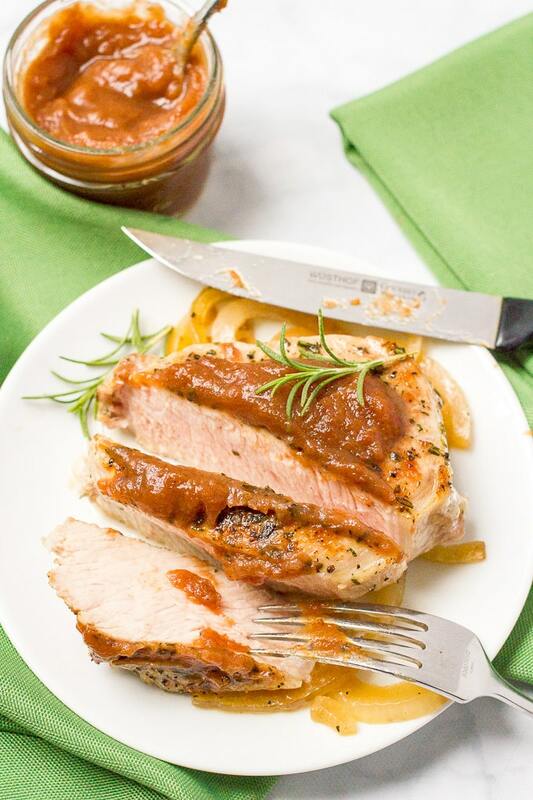 Spread a tablespoon of apple butter over each pork chop. Transfer the pan to the oven and cook for 8-10 minutes, until the pork is almost cooked through. (The temp should be about 145 for medium-rare, after it's rested. Go to 155/160 for a more well-done pork chop.) The timing will depend on the thickness of your pork chops. 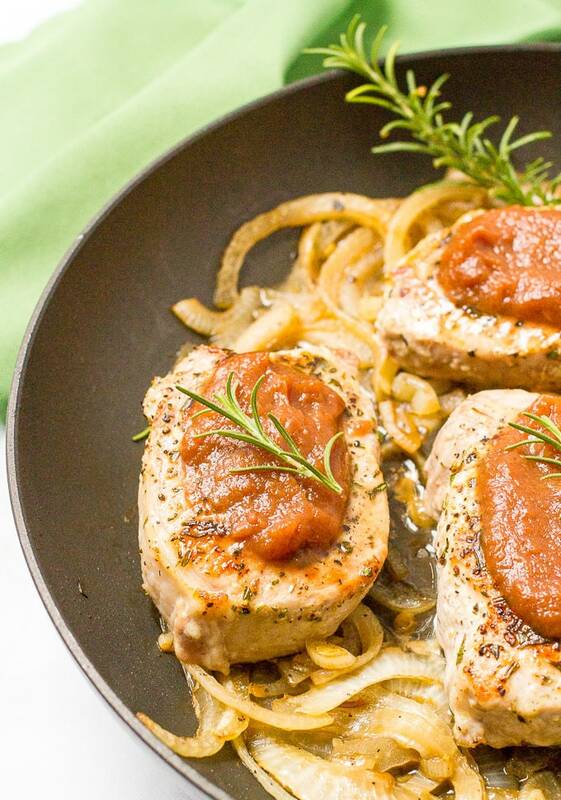 Remove the pan from the oven and let the pork chops rest for 5 minutes before serving. Eeek! I certainly hope you feel better soon, Kathryn! Being sick is the worst and it seems like it’s going around, which makes me want to stay locked in my house! Lol. 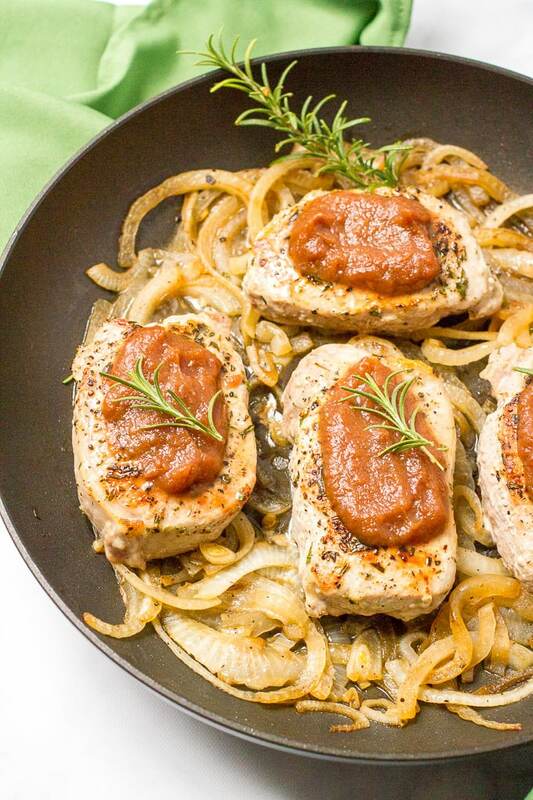 Anyways, loooooove me some pork chops with apples and onions, so this is totally calling my name! 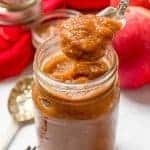 This is such a delicious way to use that apple butter!! Dinner perfection, friend! Cheers! 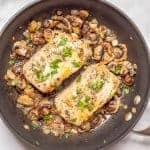 This looks like such an easy but yummy fall supper! Haha, agreed 😉 Thanks Krystle! it looks so tasty and attractive. I love the colors of the pork and the way you decorated your dish as well.